Innovative prisoner rehabilitation initiative The Clink Charity has opened bookings for its latest fundraising event as it looks to expand its award-winning prisoner training concept across Her Majesty’s Prison Estate. 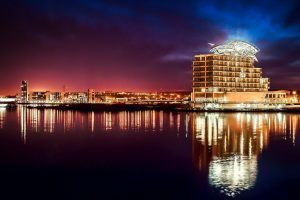 The dinner, taking place on Thursday 28 September 2017 at the five-star St David’s Hotel in Cardiff Bay, will once again raise vital funds for the charity’s work in reducing the reoffending rates of ex-offenders through hospitality training, education and work-based experience.The event will also support the continued development of further Clink training projects, following the same successful framework as the schemes currently in operation at HMP Brixton in London, HMP Cardiff, HMP Styal in Cheshire, HMP High Down and HMP Send in Surrey. Guests of the evening will dine on a four-course menu created by Martyn Watkins, executive chef at St David’s Hotel, using all-British and locally sourced ingredients where possible. Welcomed with Champagne on arrival, diners will enjoy carefully selected wines throughout the evening, kindly donated by wholesale giant Booker. Supporting Chef Watkins in the kitchen will be Clink chef Sebastian Vanoni as well as 10 Clink graduates who have successfully completed The Clink’s impactful training programme and are now in employment within the Welsh community. The event will showcase some of the finest cuisine on offer in Wales, with The Clink Restaurant at HMP Cardiff currently #1 of 913 Cardiff restaurants listed on TripAdvisor; testament to The Clink’s kitchen staff and trainees. The Clink’s fundraising efforts this year haven’t gone unnoticed, with the likes of The Clink Charity Ball – which took place in London in January 2017 – raising over £30,000 for the charity. The Clink recently received a £10,000 prize fund after being presented the Centre for Social Justice Award for ‘Social Enterprise’ in March, which will go towards building more Clink projects and setting up a Clink Support Workers Fund. This will provide financial support to graduates as they re-enter society, gain employment and find their independence. Tickets to the exclusive fundraising dinner are priced at just £75 inc. VAT per person, with tables of 10 priced at £700 inc. VAT. A table raffle and auction will also be held on the evening, with all proceeds going to The Clink Charity and its ongoing commitment to prisoner rehabilitation. To purchase tickets to the event, email cardiff@theclinkrestaurant.com. With six training schemes currently in action, the charity is now well on its way to fulfilling its mission of having 20 training facilities in operation by the end of 2020 which will see more than 1,000 highly trained and qualified Clink graduates enter employment each year.